Polyaire Service - Polyaire Service aims to provide the best service available in Air Conditioning repair and servicing in Queensland. 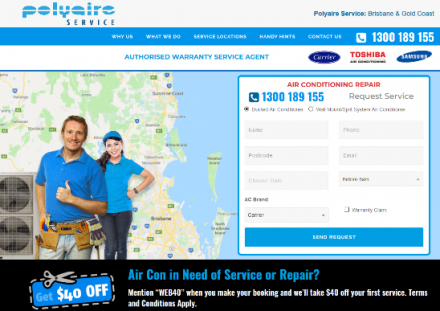 Polyaire Service aims to provide the best service available in Air Conditioning repair and servicing in Queensland. We offer service technicians specialising in home ducted, wall split/wall mounted systems, and commercial air conditioning. Our technicians are trained and qualified to work on all types of heating and cooling units, including ducted reverse cycle systems, split system air conditioners, cassette air conditioners, and more. We also offer air conditioning maintenance programs for your office, showroom, medical centre, factory or other commercial or retail space. With a commitment to providing an exceptional level of customer service, Polyaire Service is here to help you stay comfortable at home with professional repair staff. Description: Need Your Air Conditioner Serviced? We offer service technicians available 24/7 across the Sydney Metropolitan area specialising in home ducted, wall split/wall mounted systems, and commercial air conditioning.